Many overlook their water heaters until they shiver under a cold shower. Simple maintenance procedures can be performed in order to keep a water heater running properly and efficiently. Here are common issues along with water heater repair tips on how to maintain your unit at home: As water is pumped into the tank, sediments and minerals settle at the bottom. The rate on how it builds up depends on water quality, and if left unchecked, rust will also form and eat up the tank's material. The water heater is actually forced to work harder and there are instances where the bottom part would surprisingly fall off. You will then require Water Heater Repair in Queen Creek, AZ sooner than the ideal service life of your unit. All you need to prevent this from happening is to drain your tank regularly. This immediate water heater repair step will remove anything that's blocking the heat source from effectively heating up your water to your desired temperature. Any hissing or sizzling sounds are often addressed as well, since the sediments are causing the noise as water passes through. If your unit does not yield the right water temperature, try to adjust the temperature level, reset the thermostat or raise the temperature settings. Check if the warmth of the water changes in line with your preferences. Water heaters with problems such as a leaks sourced from a pressure-relief valve or coming from water supply pipes may need the valve or pipe fittings changed. 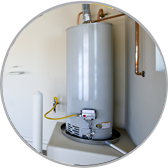 If this Water Heater Repair in Queen Creek, AZ does not fix the issue, then an entire water heater replacement may be necessary, especially with old water heaters that have functioned for over 10 years.